Although extra affordable for Prime subscribers, Amazon Music Unlimited lacks the personal touch. What is Amazon Music Unlimited? 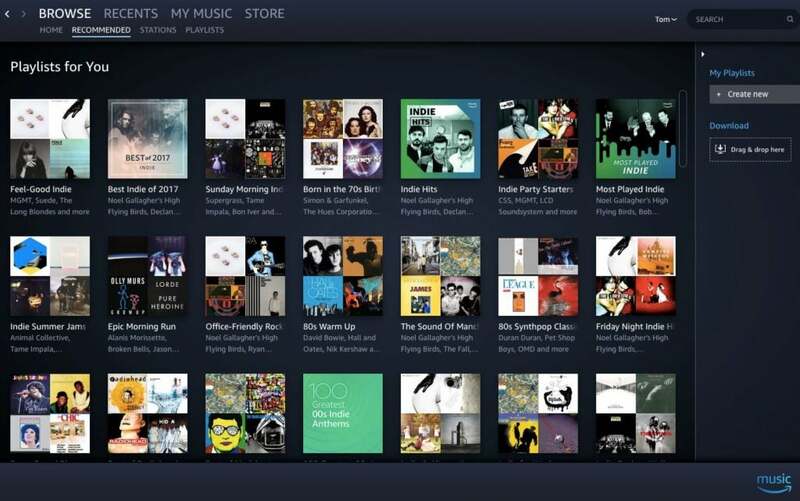 Music Unlimited is Amazon’s full-fat streaming service. While standard Prime Music comes as part of an Amazon Prime subscription; Music Unlimited costs £9.99 a month and offers 25 times more songs. If you’re already a Prime member and want to upgrade, the price drops to a very competitive £7.99. There’s no free, ad-supported option, although you can try it out for 30 days without paying. Music Unlimited works on iOS, Android, PCs, Macs and Amazon’s own hardware, including Echo speakers. So is it worth going all in and adding another thing to your mounting monthly Amazon bill? Fire up Music Unlimited on any platform and you won’t find anything that will particularly surprise you. 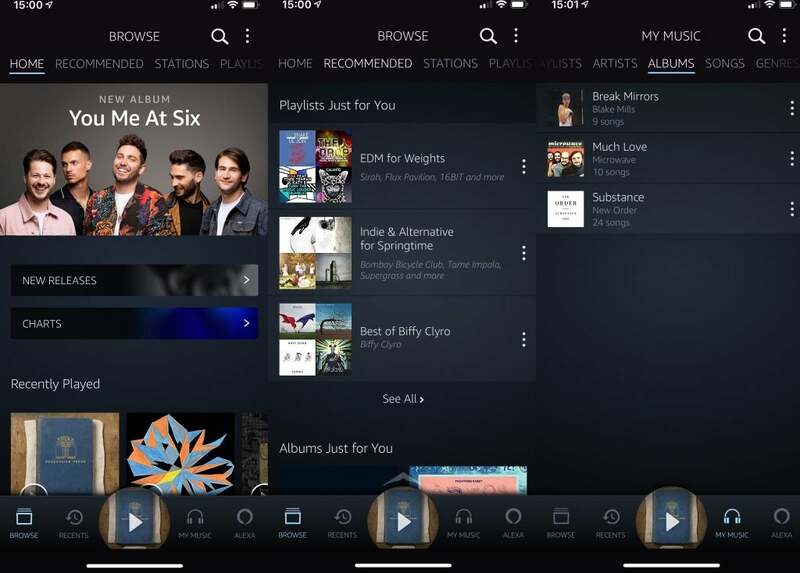 There are slight variations across each one, but the general layout is divided into Home;Recommended, Stations and Playlists;with separate tabs for recently played music and stuff you’ve added to your library. If you find something you really must own, there’s also a link to Amazon’s Music Store. The mobile app swaps this for an Alexa button (more on her later). The mobile app also throws in a dedicated Offline Mode, which only shows songs you’ve cached for offline listening. It’s handy to see what’s available to you when you have no internet connection. But you really have to dig into the settings to activate it;or turn it off when you’re back online – it’s just a bit clunkier than it should be. 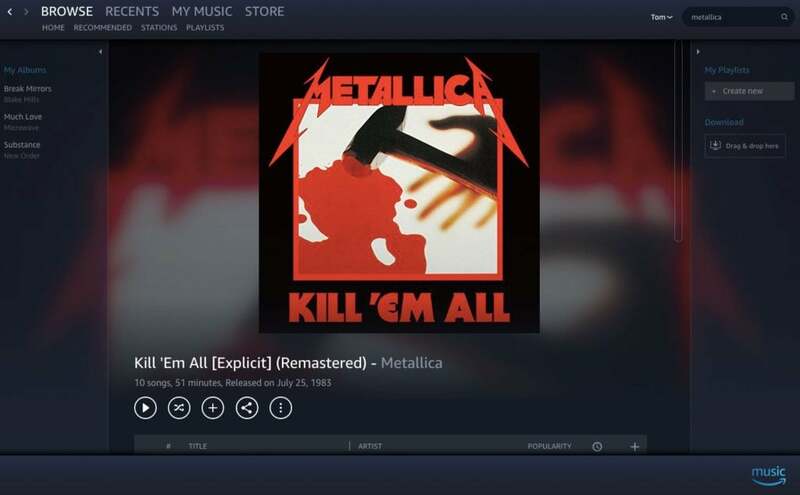 The desktop app allows you to download songs you own, but there’s no Spotify-style; caching of tunes to listen to when you don’t have an internet connection. On the apps, the search bar allows you to choose whether to look in your library; across the whole streaming catalogue or in the Amazon Music Store; It can be easy to inadvertently select the wrong location here; so you do have to be careful that it’s looking where you think it is. Otherwise you might think Phil Collins has taken all of his songs off the service (what a nightmare). Apart from that, it’s generally intuitive and user-friendly. Dragging up on the circular ‘now playing’; icon at the bottom of the mobile app is a nice touch; although things can be a bit slow to load on the web-based version. You can use up to 10 devices on one account, although if you start playing on one; it’ll stop on any others. To use multiple devices at once, you’ll need a £15-a-month family account. With 50 million songs at your disposal, Amazon Music Unlimited’s catalogue effectively lives up to its name. Search for your traditional streaming refuseniks, such as Jay-Z and Taylor Swift, and you’ll find plenty to listen to. In fact, Jigga actually has more available here than on Spotify; plus it doesn’t do that annoying thing of defaulting to radio edits that some streaming services do. There’s the odd exclusive, but they tend to be live recordings; such as Jack White’s Kneeling at the Anthem D.C, or, er, Garth Brooks albums. Certainly nothing to sign up for specifically. A significant chunk of the home page is taken up by playlist suggestions. While there’s a lot there to choose from, they’re pretty generic and nothing really jumps out. The suggestions also feel very much like they were put together by algorithms. Although dig deep enough and you should find something with a few surprises on it. Hip-Hop for Housework, anyone? While Amazon hasn’t disclosed the specific bitrates it offers; everyone gets to choose how good they want their music to sound. By default, it’ll adjust automatically depending on the strength of your connection, which can be handy when out and about. But you can also select from low, medium and high quality. Only a masochist would choose to use anything other than high quality, and it holds up well against the competition. It doesn’t sound as lively as Apple Music; but it’s certainly comparable with Spotify’s highest-quality 320kbps streams; with perhaps a touch more subtlety about it when heard through a decent pair of headphones. 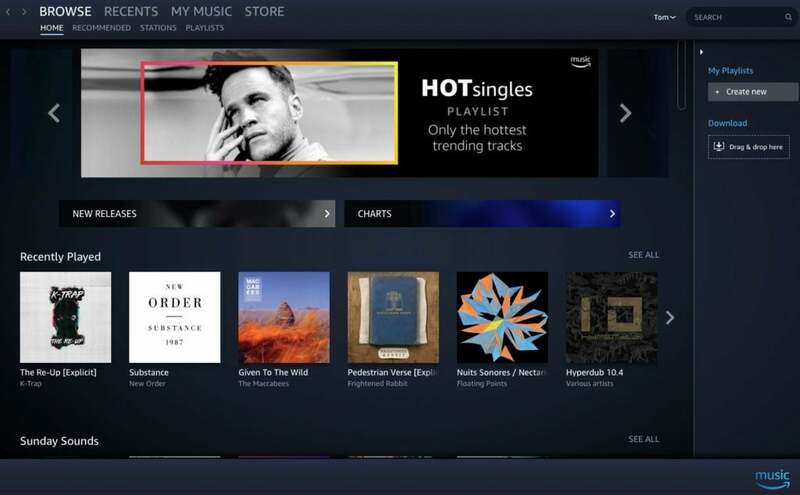 Amazon Music Unlimited offers its fair share of curated playlists on its home page and recommended tab; but there’s nothing as bespoke here as Spotify’s Discover Weekly or Daily Mix playlists. It’ll serve up a huge selection it thinks you will like, but it almost goes too far; offering up so much in the hope something will stick. None of the playlists have been put together just for you, though; and you tend to see the same things over and over again. There’s no way of telling it what you like or don’t like either; so you can’t actively help its recommendations to improve. The lists of albums and songs it recommends tend to be dominated by artists you’ve already listened to; which isn’t exactly rocket surgery. And when it does go out on a limb to suggest something new, the results often just seem lazy. Recommending New Order to someone because they listened to Joy Division basically assumes they are a moron. To some, this assessment might seem harsh. But music discovery is the main battleground for streaming services these days. While Amazon Music Unlimited pushes plenty of albums and playlists that are ‘for you’, it just doesn’t feel particularly personal. When using the website or desktop app there’s no option to send your music anywhere else; but the mobile app has Airplay built in; plus you can obviously just use a standard Bluetooth connection to hook up an external speaker. It’s slightly odd that Spotify Connect; allows you to connect to Echo devices from an app more easily than Amazon’s own one does; but perhaps it’s a conscious choice to encourage more people to use their voices. Using Music Unlimited on an Echo device is ridiculously easy, though. You can start the free trial just by saying: “Alexa; try Amazon Music Unlimited,” and once it’s set up, you can do everything you need to with your voice. The only thing that might stump you is choosing what to listen to ; it can be surprisingly difficult without anything to browse. Amazon offers a single-device plan for £3.99 a month; which means your Music Unlimited access is tied to one specific Echo product. Smart speakers tend to be communal devices; so if you want everyone in the family to be able to play music on it; whether the account owner is streaming tunes elsewhere or not; this is a pretty affordable way to do it. Despite having Prime Video on its books; Amazon hasn’t bothered to include any video content on Music Unlimited;but considering how half-baked it is on most streaming services, it doesn’t feel like a big miss at all. The main thing that sets the mobile app apart from the others is that; regardless of which OS it’s on, it has Alexa built in. But in everyday use, its benefits are limited. In order to use it, you must first fire up the app, then press the Alexa icon before speaking. As well as asking for particular songs, artists; albums and playlists, you can also search by lyrics;which is something Apple’s HomePod only just got with the iOS 12 update. Overall, it works well and is generally quick to return results. But those extra steps that don’t exist ;when using Alexa on an Echo speaker make it far less useful and unlikely to become second nature. Even Siri on an iPhone and Apple Music have a closer relationship. Why subscribe to Amazon Music Unlimited? Apart from the built-in Alexa support; which is of limited use anyway; there’s nothing about Amazon Music Unlimited that really sets it apart from any of its rivals. If you just want something you can use exclusively on an Echo speaker and nowhere else; Amazon’s £3.99 single-device plan makes Music Unlimited a bit of a steal. But it doesn’t seem like that applies to too many people in the market for a music-streaming service. Even with the reduced price offered to Prime subscribers, Music Unlimited is hard to recommend. 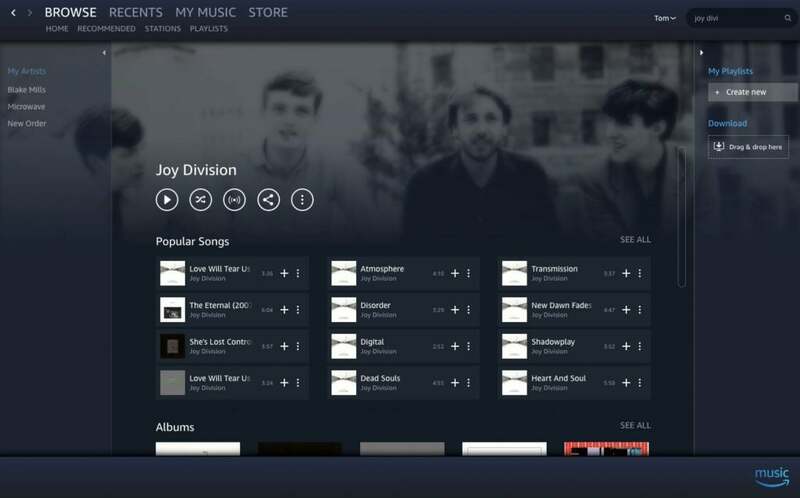 While it does the basics well enough, with Spotify and Apple Music offering better discovery features; it’s difficult to shake the feeling that Amazon’s platform doesn’t entirely deserve its name. How to remove the grafted eyelashes ? Generally, the grafted eyelashes used in the beauty eyelash shop use glue to glue the artificial eyelashes onto the natural eyelashes. Therefore, you must be very careful when using some false eyelashes. If you don’t handle it properly, you will remove the real eyelashes. Today, the beauty eyelashes of the US beauty eyelashes, tell you how to remove the grafted eyelashes? The first method: the first step is to use a cotton swab myopic glue remover to ensure that the cotton swab is completely saturated. The second step is to gently wipe the upper eyelid with a cotton swab, and then slowly wipe around the outer contour of the eye. From the outer contour to the inner contour, gently apply a small circle and remove the agent. Will slowly melt the glue. Step 3: Use a cotton swab to gently wipe the eyeliner position about ten times. Hold the root of the false eyelash with your thumb and forefinger. At this time, the graft will be easily removed. The fourth part is after we have removed the eyelashes, then wipe the upper eyelid with a remover to remove the residual glue. Finally, wash the eyes and face with warm water and clean the residual scavenger. The first step is to burn a pot of hot water to produce steam. At this time, face the steam, keep the surrounding steam near the face, and the hot steam will help loosen the false eyelashes. In the second step, soak the olive oil with cotton balls or cotton pads, and wipe the roots of the eyelashes with a cotton ball, taking care not to get your eyes. Continue to wipe the eyelashes until the false eyelashes are completely dropped. The third step is to put the face in the washbasin and let the eyelashes touch the hot water. Rinse off the olive oil, and the grafted eyelashes are washed down. Olive oil effectively dissolves the glue that grafts the eyelashes and also moisturizes our own eyelashes. How to remove the grafted eyelashes , these two ways to easily remove the false eyelashes. Pay attention to me to become white and beautiful! Join me to become a local tyrant! Beauty eyelashes joined the phone: 021-60524377 beautiful beauty eyelashes, to give you the most professional, cutting-edge, most fashionable eyelashes pictures and information! If you want to know more about the eyelashes, please copy and open the official website.